Performing due diligence is a critical component of EnergyNet's online marketplace. We are excited to offer the most comprehensive and accessible due diligence information in the industry. Learn about Energynet's online due diligence information and the EnergyNet Internet Data Room (IDR) here, plus tips that will aid your due diligence research. Every property sold in the EnergyNet continuous online marketplace has a "Property Information Page" that contains a wealth of due diligence information. This information is organized in a format that is standard across the EnergyNet website in order to assist with your due diligence research. 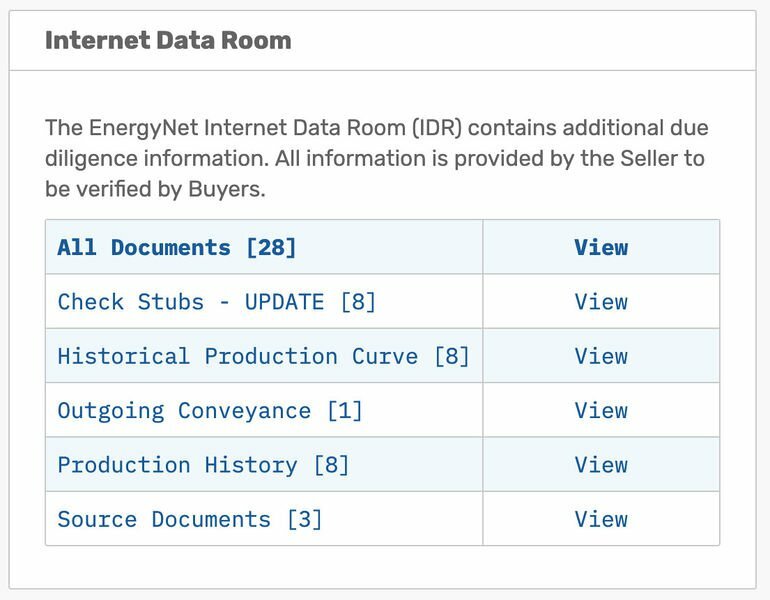 The property information sheet also links you to the EnergyNet Internet Data Room (IDR), which contains copies of original documents submitted by sellers, including agreements, check stubs, drilling reports, historical production curves, logs and well data, maps and plats, and much more. Data packages for each lot are available on the property information pages for free download, or can be purchased printed and bound for a reasonable fee. The EnergyNet Internet Data Room (IDR) provides a simple interface to access all a wealth of due diligence data from one screen. You can browse through individual pages, multi-page documents and multiple document sets all from the same interface. Intuitive controls allow you to view lists of documents, thumbnails of pages or both at the same time. When documents are presented in a variety of file formats, you'll be able to switch between formats through a simple drop-down menu. You'll also have the ability to fill your entire computer monitor with pages and the minimal controls necessary to navigate through them, putting more due diligence information on the screen than ever before. You access the IDR by clicking and of the "View" links in the Internet Data Room section of the property information page you are viewing. The lot number and short description. The current document within the document set that is being displayed. The following controls appear on the IDR Control Panel. Format drop-down selector: Many times, a particular page or document is available in multiple file formats. When you are viewing a page where this is true, you have the option to switch between the different available formats. PDF: PDF, or Portable Document Format, is a widely-used, multi-page format. Viewing a document in PDF format requires the Adobe PDF browser plugin. When viewing a PDF document, you may save or print the document from the toolbar at the top of the document. GIF: Another standard image format, but with the option to zoom into and out of the images. Most documents in the DjVu format are also available as GIFs. Download: Click the "Download" button to download only the currently viewed document. Note that you can always download the full Data Package of all documents from the Data Packages section of the property information page. Show/Hide Pages: This button will display thumbnail-sized pictures of the first page for all documents. The document you are currently viewing is highlighted in dark blue, and the document of the thumbnail you are hovering over is highlighted in light blue. When viewing the pages this way, click the one you would like to view and it will be displayed immediately. The Page View hides itself after you make a selection to give you more room to view the document. Important Tip: Most modern web browsers let you put the browser in fullscreen mode by pressing the "F11" key on your keyboard. Press F11 again to return to standard mode. Return to the property information page: This button returns you to the property information page for the property you are viewing. Navigate: The navigation buttons let you advance to the next or previous pages in a document set, or skip to the first or last page.